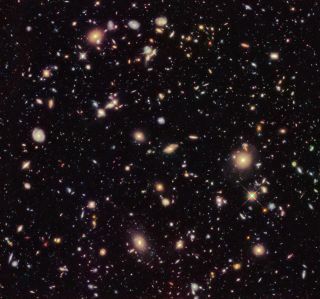 An improved version of the Hubble Ultra Deep Field from 2012, as seen by NASA's Hubble Space Telescope. Paul Sutter's new book, "Your Place in the Universe: Understanding Our Big, Messy Existence" (Prometheus Books, 2018), takes readers on a far-reaching tour of the cosmos and explains, in readable and humorous prose, how scientists tackle the biggest of questions. Sutter is an astrophysicist at The Ohio State University and the chief scientist at COSI science center. He also hosts "Space Radio" and the "Ask a Spaceman" podcast, leads AstroTours around the world and frequently contributes to Space.com's Expert Voices: Op-Ed & Insights. Space.com: Why did you decide to write this book? What did you hope to get across? Paul Sutter: I decided to write the book in part because there are some stories in science that I couldn't tell over any other medium — that I can't tell in a podcast, or an article or a TV spot. In the story that I want to tell, what I wanted people to come away with is the story of our entire universe. It's a biography of the home we live in, and the stories of how science has come to understand that universe. Space.com: Are there any particular aspects of that biography that you think it's most important to learn about? Or is it the entire picture? Sutter: It's this wonderful, beautiful, ironic dichotomy where, as the centuries progressed, we've learned just how insignificant and unimportant we are in a grand cosmic scale. And yet, little tiny humans on little tiny Earth are able to come up with the tools to understand the whole thing. How awesome is that? Space.com: And it is ironic — the more accomplished we become and the smarter we get, the more we learn how insignificant we are. Sutter: Exactly. We learn that we're insignificant, and yet we learn that the universe — as grand and big and cold and uncaring as it is — is not that different from Earth. The physics [we experience] on Earth are the same throughout the universe. There's a certain beauty there, a certain connection there, that we've discovered through the centuries. Space.com: This book covers a lot of ground. Were there any sections that stand out to you — as the most fun to write, say, or the most important? Sutter: Picking my favorite topic is like picking my favorite kid. The whole book was a treat to write. You share these stories to tell of the wild twists and turns in our understanding, and the crazy twists and turns in the evolution of the universe itself. What I found really powerful, as I was doing my own research, was the writings of the scientists themselves, in the 1800s, in the 1600s, in 1998. In all of these different eras, scientists are tackling the same problems and wrestling with the same kinds of issues. They might be more sophisticated than their ancestors, but it's always the same question popping up again and again, which is, basically, the title of the book: What is our place in the universe? Space.com: What does that tell us about human nature? Does it reveal insights about who we are — how we tackle this question, or that we keep coming back to it over and over again, with varying degrees of success and precision? Sutter: Yeah, it tells us something very deep about human nature. So many of us have looked up at the night sky and just wondered: How do we fit in? What does it all mean? And what I want people to feel is that they are not alone in asking those questions. These are the exact same questions that have motivated scientists through the ages. Space.com: And speaking of "they are not alone" — that's another big question. Are we actually alone? Is Earth life the only life in the universe? People have tackled that over the eons, and now we're starting to be able to answer it in a more scientific way, now that we know more about exoplanets, and that there are potentially habitable alien worlds in our own solar system. Do you see that as something that's catching people's interest now more than it used to? Space.com: Knowledge is always accelerating because it builds on itself, but it feels like now is a really special time — that we're getting to the point where answers to some of these big questions are actually within reach. Did you want to try to get that point across in the book — that we're living in really exciting times, scientifically speaking? Sutter: Yeah, absolutely. What I try to set up in the book is show how, as we progress in observation, we learn more and we come up with new questions — questions that we couldn't even conceive of before. We struggle with those questions, and there's a lot of tension and argument, and then new observations come in and we answer those questions — and that brings up new questions that we'd possibly never conceived of before. And this cycle repeats over and over and over, and that's the story of science. And where we are now, with our mysteries of dark matter and dark energy and the fate of the universe, is part of a longer, continuous discussion and conversation we've been having for centuries. Space.com: So, "Your Place in the Universe." I realize that the whole book is a foray into what that place is, and how scientists are tackling this big question. But if you had to distill the book's title into a sentence or two, how would you do it? What is our place in the universe? Sutter: Our place in the universe is simultaneously the middle of nowhere and yet the center of everything. It's simultaneously absolutely insignificant and one of the most special things to ever happen in the cosmos. Space.com: And you make this point in the book: There is no actual center of the universe, but wherever you are is the center of the universe from your own perspective. That may be another way of looking at it. Sutter (laughs): And there's probably a really wonderful self-help metaphor buried in there, too. Learn more about "Your Place in the Universe" via Prometheus Books. The book is available for purchase on Amazon.com.